India, Nepal and Bhutan tour - A Cultural adventure in south Asia with Himalayan Panorama!! India - Nepal - Bhutan adventures - 18 days: A Cultural adventure in south Asia with a focus on local cultures and historic sites, this tour is not physically demanding and have the perfect mix of discovery, exploration, comfort and relaxation. In this unique 3 country tour you will see the Historical wonder incrediable Taj Mahal on the Top of that see the natural wonder the HIMALAYAS! at one go. No doubt this is one of the most unique adventure to south Asia. Enjoy it with locals in a resonable price with professional and personal touch! We have only Nepal and Bhutan tour of 12 days as well as the tours to Buddhist curcuit like Lumbini, Bodhgaya, Sarnath, Kushinagar, Ajanta, Elora caves along with regular sightseeing spots. You can also book tour for honeymoon trip to Bhutan, India ( Taj Maha)l or Nepal. Best way to experience 3 Asian exotic countries (India, Nepal & Bhutan) at one go! the abandoned city of Fatehpur Sikri and Hindu death body cremation center Varanasi. 5 days in Nepal with excursions of Birth of Buddha, Jungle Safari in Chitwan, world heritage sights in Kathmandu + Himalaya! 5 days in Bhutan tour, the most beautiful country in the world! Bookings open for 2010 : India, Nepal and Bhutan tour, please contact us for details! India - Nepal - Bhutan tour is our most popular tour in last 3 years.. This beautiful Himalayan cultural journey will takes us from plains of incrediable India to the mountain kingdom of Nepal and the last Shangri-la on earth Bhutan, experiencing great contrasts along the way. In India we discover the sights of old and new Delhi before exploring the 'Pink City' of Jaipur in Rajasthan. Our next stop is the magnificent Taj Mahal before we continue to Varanasi by overnight train. Here we take a boat ride on the Ganges River and see Hindu pilgrims praying and bathing at this holy city. We then drive to Nepal, where we visit the birth place of Lord Buddha - Lumbini before heading into the jungles of Chitwan National Park in search of rhino and royal bengal Tiger. Next stop is the former hippy paradise and Nepalese capital, Kathmandu. We then we fly to the Dragon Kingdom - Bhutan ( the last sharngri-la on earth). After landing in Paro we continue on and explore the capital, Thimphu, visit the famous Tiger's Nest Monastery and take in the splendour of the alpine countryside of Punakha seeing the impressive Dzongs. 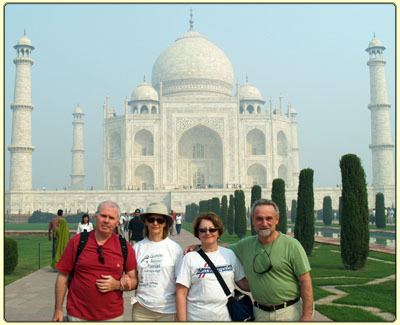 Arrival Delhi - India : Every visitors arrives Delhi from same or different destinations. Reception by Earthbound Expeditions representative and transfer to the hotel and rest. Full day in Delhi : Visits the old and new Delhi. We visit the Red Fort built by Emperor Shah Jahan, the Jama Masjid, the biggest mosque in the India, the Raj Ghat the memorial of Mahatma Gandhi; we will walk along the Chandni Chowk, the silver street of Delhi bustling with activity. In the visit of the New city we will see the India Gate an Arch of Commemorative victory; We will also go by the Presidential residence Rashtrapati Bhavan, the Parliament Sansad Bhavan and Government buildings of the secretary; Connaught place, commercial and managerial center. Drive to Jaipur and visit Amber Fort, Hawa Mahal (Palace of the Winds), City Palace Museum and Jantar Mantar. The Taj Mahal, recently voted one of the new seven wonders of the world, was built by Mogul Emperor Shah Jahan between 1632 and 1654 for his favorite wife, Mumtaz Mahal. Soon after its completion, Shah Jahan was deposed by his son and imprisoned at the nearby Agra Fort. On 6th night we take train to Varanasi. Explore Varanasi's old town area and enjoy a sunrise boat ride on the Ganges River. Visit Sarnath - the first place where Buddha gave his first teaching after enlightment. Drive to Lumbini in Nepal. Visit Lord Buddha's birthplace. Drive across Nepal's Terai region to Chitwan National Park one of the Asia's finest national park. Explore on foot, in canoe, by jeep and on elephant back. Final safari in Chitwan before heading to Kathmandu. On day 12th and 13th Visit Boudhnath Stupa and Pashupatinath Temple. Also visit the monkey Temple of Swayambhunath and Patan Durbarsquare. Option of scenic flight for views of Mount Everest. Spectacular flight along the Himalayan range to Paro, Bhutan. Drive to the capital, Thimphu. Explore the fortress and painting school in Thimpu. Today we drive to Punakha valley, a wonderful chance to see Bhutan's beautiful countryside. Go via the Dhachu la pass. 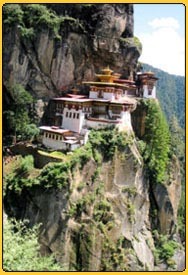 Drive to Paro, visit the Taktsang (Tiger's Nest) Monastery and explore the local villages and countryside. Trip ends in Paro Bhutan today, you have option to fly to Delhi at USD 346, Bangkok at USD 361, Kathmandu at USd 196, Culcutta at USD 221 or have option to extend trip to Sikkim Darjeeling or even to Tibet at extra cost. Any meals except included (allow about US$ 200 - 250 for meals), entrance fees (allow about US$ 40), airport tax, tips, and international flights up to Delhi and out from Paro and any other cost that is not mentioned above. Single suppliment can be added if using single rooms. Please read Lonely planet and other travel books well before coming to travel so you are well informed about the culture and customs here. Although our effort is there please don't expect very luxury service, it is more experience then luxury. In a group of less the 10 people we use local resource as guide, if the group members are over 10 people then our leader Mr. Rajan will lead the trip personally. Please read our comments for more information about us. We run tour for small groups too. Important note: From 2010, June onward the Bhutan tour price will be be raising by USD 100 per night per person more so please expect at least USD 400 more on above cost for 2010. At the crossroads of the great civilizations of Asia, seven groups of Hindu and Buddhist monuments, as well as the three residential and palace areas of the royal cities of Kathmandu, Patan and Bhaktapur, illustrate Nepalese art at its height. Among the 130 monuments are pilgrimage centres, temples, shrines, bathing sites and gardens – all sites of veneration for both religious groups. You can add Everest Experience mountain flight which flies around mount Everest about 1 hour giving close up view of the world's gretest natural wonder at extra cost of US$ 177. The Bhutan tour can be combined for festival dates, ask for the 2010 Bhutan festivals. Can make some trekking in Nepal and Bhutan as well. The tour can be combined with Lhasa Tibet tour, Darjeeling and sikkim as well. Or can add the Buddhist sites like Boudhgaya, Kushinagar, Sarnath, Anjanta , Elora caves.